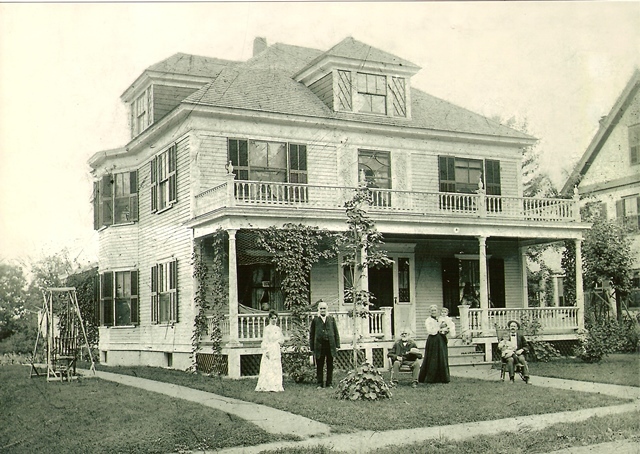 The home of Charles A. Daniels was built about 1901 and is shown in this 1904 photograph with the family. Photographed are his wife Anna, her father David Sheldon and her mother Sarah who is holding Anna’s second child, Lorraine. Seated on the steps is Rev. Franklin Chapin, the Congregational Minister. Seated at the right is Charles A. Daniels holding his oldest child Raymond. Once a part of the Gillis Estate this house lot was purchased by Charles A. Daniels in 1901. Charles Daniels was the Hudson Postmaster from 1903 until 1921 and one of the proprietors of Daniels and Gilbert Store at the Bridge. The home remained in the Daniels family until purchased by the family of Robert and Martha Smith in 1949. This building is located at 35 Central Street and is owned by the Smith family and is home to their family business Smith Plumbing and Heating. By Ruth M Parker in Central St on January 12, 2015 .